This is a book for working women and mothers who are ready to release the culturally inherited belief that their worth is equal to their productivity, and instead create a personal and professional life that's based on presence, meaning, and joy. 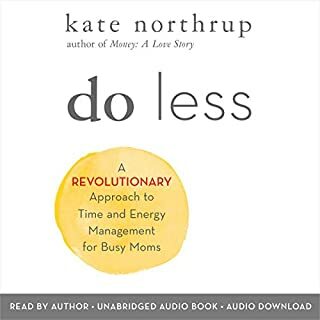 As opposed to focusing on "fitting it all in", time management, and leaning in, as so many books geared at ambitious women do, this book embraces the notion that through doing less women can have - and be - more. 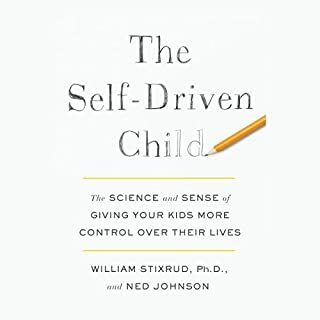 Research has shown that the first three years in a child's life are a critical moment in their development, and that behavior patterns instilled during that time can have profound implications for the rest of a child's life. 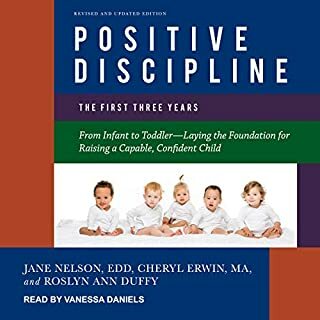 Hundreds of thousands of parents have already used the advice in Positive Discipline: The First Three Years to help set effective boundaries, forge strong foundations for healthy communication, and lay the groundwork for happy and respectful relationships with their young children. 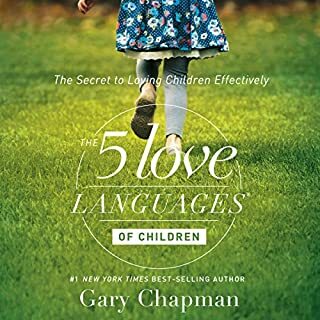 The ultimate “parenting bible” (The Boston Globe) with a new Foreword—a timeless, beloved book on how to effectively communicate with your child from the number-one New York Times best-selling authors. * Depersonalize negative interactions by mentioning only the problem. "I see a messy room." * Attach rules to things, e.g., "Little sisters are not for hitting." * Children need to learn to choose, but within the safety of limits. * Limit criticism to a specific event—don't say "never", "always", as in: "You never listen," "You always manage to spill things"
Dad "I see a messy room"
To top it all, this particular version of the book is about half full with the old 70's book and the last 6 chapters are just letters from parents telling these authors how amazing they are and how they saved the world (it felt like a giant ego stroke)... I feel everybody would be far better served by just reading Dr. Ginott's original work "Between Parent and Child (1965, Macmillan)"
As a child I remember that this book was one of the reference book which my mom used to study it in University for her psychology ckass. I rember that I really liked it because of the drawings and illustrations which made it very easy for me to understand such facts as child. 30 years passed and I became a mom myself. During all these years I have tried to find this book again and asked my mom thousands of times, but she could not remember the title. To make the story short I picked this book in #Audible1 and finished it. As a habbit I buy a hard copy of the books that I listened to and enjoyed for future reference. I did purchase this book though in order to translate it ti farsi, when I have got to the second chapter of the book- for translation purpose-I immedietly recalled the comic like drawings!! !I went through the book like crazy so happy that I finally found this book after all these years. I have searched the title in Farsi and found thd version that I have seen jn my childhood. Yup no need to translate, it was re published more than 100 times already!!! Anyhow...this is a must read book for every parents whi want to raise confident yet emotionally intelligent children. I just don't know why my mom did nit follow the instruction for her real life outsude if the university?? lol. I have all versions of this book , Paper, pdf, Audio....so it is in my immediate access when I need it. To my experience it will be much beneficial to start with the paper book at first hand , because there are some assigments after each chapter which will be so so beneficial if you take your time and do it/ write it. A must read for all parents! So helpful! This was just what I was looking for and has inspired me to keep on with becoming a more effective parent for my children. My kids and I will benefit so much from the changes I will be implementing. A book well worth your time. I cannot wait to use my new-found knowledge and understanding. Thank You. I am not a fan of the narration, I kept finding myself tuning out due to the monotone robotic-like voice. listen to this book with notepad and pen in hand. discuss with your partner and complete the exercises. I'm so glad that my friend told me about the book! valuable skills to have for dealing with the most precious people in our lives. just remember that change doesn't happen overnight. it takes alot of patience and perseverance. and it's worth it. I like audio books because I can listen when I need to be looking at something else, or when I can't hold a book. Unfortunately this book contains worksheets which aren't available in audio format. Perhaps pdfs could be made available. 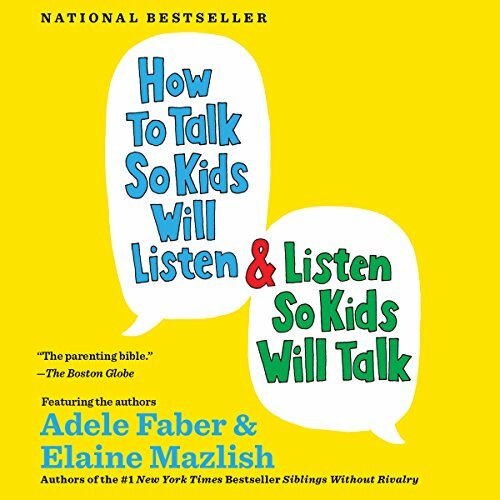 What did you love best about How to Talk So Kids Will Listen & Listen So Kids Will Talk? This is a very special (audio) book. It has transformed my relationship with my son and influenced how I listen and communicate in my professional life. 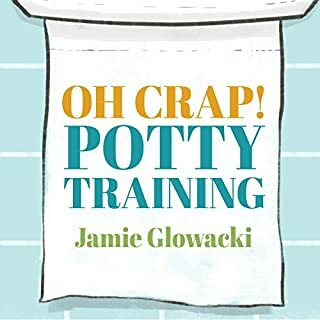 This book gets overwhelmingly positive reviews and I am writing this review to help other parents find this wonderful book. My wife and I were very proud of our positive parenting. We had received many positive compliments from friends and strangers regarding our positive parenting. Unfortunately, when we hit a rash of poor behaviour when our son began attending school, we began to question ourselves and our parenting techniques. This uncertainty lead to a downward spiral of 'old school' discipline based parenting, turning every disagreement into a battle that had to be won. Instead of helping my son's discipline, it worsened. Each time it worsened, we decided we needed more discipline. The cycle continued until I found this book. 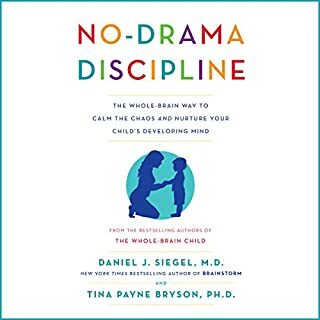 This book was similar to how we had initially decided to parent our son, but the devil is in the details and the notion that every interaction with my son could be an opportunity for him to communicate HIS thoughts and develop HIS decision making skills and confidence was a subtle yet extremely powerful shift in thinking. Its not only about me showing love and positivity to my son, its about ensuring he feels confident and positive about himself. Yes, there is a difference. I have developed much more patience and understanding, as a result of this audiobook. There is no question that the daily interactions with my son take much longer, especially initially, though I have come to realize that this extra time is really important and essential to being a good parent. Like most things in life, long term effective solutions are always more time consuming and complex than short term quick fixes. That being said, my son has now developed very effective problem solving and communication skills. These skills have have allowed us to spend our time and attention learning and sharing thoughts on how to solve problems; instead of locking wills and trying to defeat one another in a battle of wills. 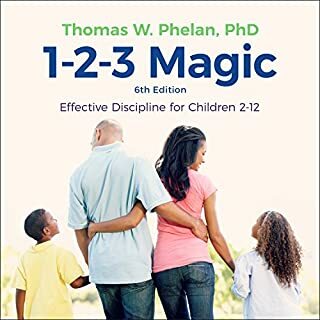 After adopting the techniques in this book, I can honestly say that I have experienced a very special transformation in the relationship I have with my son. I am in awe of his creative problem solving skills, he surprises me daily, and we have developed an even deeper bond of love and support. 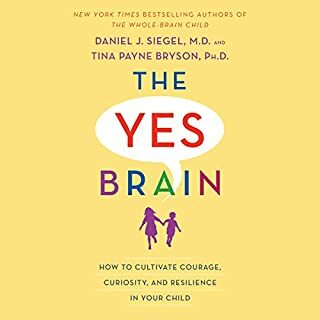 I recall thinking, as I listened to the audiobook, that a number of the examples seemed very hokey and the descriptions of how children would react to simple questions as a little too perfect. Yet once putting the techniques into practice, I found myself often reaching for paper to write down the incredible responses my son would have to the simple questions. There is an example in the book, where it advises parents to consider the power of saying 'you must be proud of yourself', rather than 'I am proud of you'. I have seen a number of negative or mediocre reviews that cite this as a criticism. While I still mix in the odd 'I am proud of you' I will never forget the look of contemplation, nod of agreement and then smile of satisfaction my son's face when I first said 'you must be proud of yourself'. I could tell that he had not really thought of his good behaviour in terms of what it meant to him. Its now something he has developed strongly within himself. He now thinks of himself as brave, loyal and kind. He sees every day as an opportunity to learn new things and solve his own problems.I don't expect that my son will always do what I want but I can count on him to confidently tell me why he acted a certain way and listen. Totally LOVE this book. 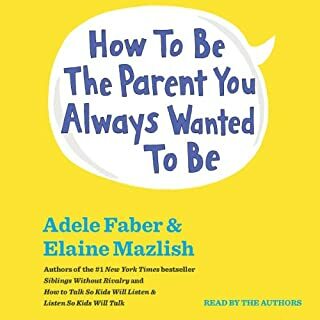 I have read a lot of parenting books but this one seems to treat children as unique individuals with unique personalities who require unique care and upbringing. It emphasizes respect and autonomy for the child rather than punishment and rewards. The trouble is that there are things in the book to ponder and consider and even role play. It is tough with an audio book. it was tough to give serious consideration on the fly with the next paragraph being read. Also, I found myself wanting to take a few notes to help me remember a few lessons that would help with my own children and unable to do so as I was commuting to work in the car. I highly recommend this book and even though it is read very well I would suggest a paper copy rather than the audio version. What was one of the most memorable moments of How to Talk So Kids Will Listen & Listen So Kids Will Talk? What about Susan Bennett’s performance did you like? her tone of voice exemplified a 'normal' mother's voice showing happiness at times and exhaustion and frustration at times. Did How to Talk So Kids Will Listen & Listen So Kids Will Talk inspire you to do anything? I plan on buying the paper version so that I can refer to it often! 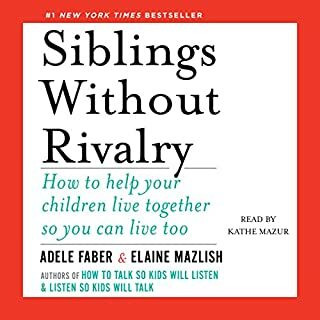 Faber and Mazlish's "How to Talk" has endured for over 30+ years in countries all over the globe for good reason: the techniques taught in this book make logical sense, are easily applicable in your daily family life, and have immediate impact. Below is a bullet summary of my highlights from this title. While the read is short (I finished it in six days), the lessons are invaluable. Bennett's narration is fine--if anything, you can really crank the playback speed on this title, the material is easy to understand. - Listen to and acknowledge your child's emotions. You wouldn't ignore physical hurt, so why would you ignore emotional hurt? Accepting your child's feelings are the cornerstone of this program. Limit the action of a negative feeling. - At the same time, don't solve the child's problems. Reword the problem for them, perhaps be their brainstorm partner. ("What can we do to fix this?") Encourage them to generate solutions and talk. Foster autonomy. Give them choices ("either we can keep playing or read a bedtime story, but not both. You pick."). - Can't get your child to behave the way you need them to? Objectively describe what you see, explain the consequence, explain your feelings. Often just one word ("pajamas!") or writing a note ("Dear Jack, I wish you would use me more. I miss you at night. Love, Your Toothbrush.") can communicate volumes. - Sometimes, you shouldn't use please. Commands are commands, not favors. - Being "sorry" is more than a word. It means that you will change future behavior. Follow through with apologies. - Do NOT talk about your kid like an object, especially if they are within earshot. If others are talking about your child's inabilities, openly state "when she's ready, she'll do that." That shows your confidence in your child that they will grow up independent someday. - Praise MUST be descriptive. "Good" or "wonderful" by itself is empty and confusing. Describe what you see when you offer praise. Often, one-word praise is the best ("You helped take the dishes to the sink! That's one responsible girl."). These turn into immutable snapshots for the child. - Developing self-esteem is one of the most important jobs as a parent. The world will do its job of trying to break self-esteem as they grow into adults. This is your chance to give them invaluable tools for life in self-praise by giving correct praise yourself. - Never use comparisons as praise, especially with siblings. - Pre-determined roles are a self-fulfilling prophecy. ("Jack is such a goof-off.") You as a parent can combat that. Show them literal or figurative pictures of themselves in more positive roles. Let the child hear you talk about them in a positive role. Be a memory for all their past good examples, recalling them to the child when necessary. If the child regresses, simply state your feelings and expectations. - Preschoolers have a tough time with the concept of winning and losing. Let everyone finish the Candy Land course, don't just stop the game when the first person finishes. 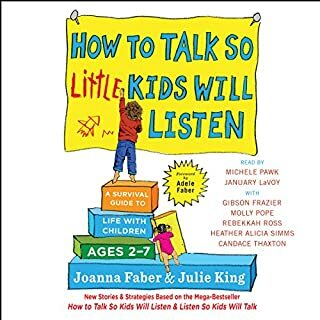 What made the experience of listening to How to Talk So Kids Will Listen & Listen So Kids Will Talk the most enjoyable? The book provided some excellent techniques for appreciating the perspective of a child and respecting them. While definitely useful, it seemed as though the suggestions were overly redundant and could have been delivered in a more efficient, less repetitive manner. Setting Limits with your Strong Willed Child. Robert MacKenzie. Have you listened to any of Susan Bennett’s other performances before? How does this one compare? Yes. 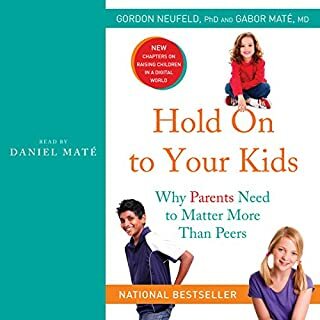 I think the portions about open ended questions had benefit and I also do think this could be a good book for someone who already has a good mutually respectful relationship with their kid and just want ways to further improve that. However, these strategies will not work on more difficult kids, the so called strong willed child. This book will be very un-helpful for you. 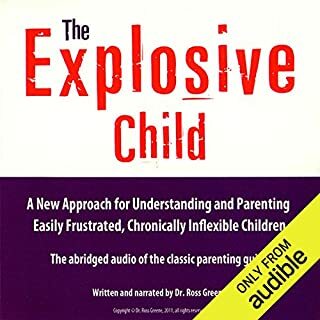 When I 1st listened to this book I probably would have given it 4 or 5 stars, but after I tried using its techniques, I realized it was not written with 1 of my children in mind, which is why I bought the book in the 1st place. 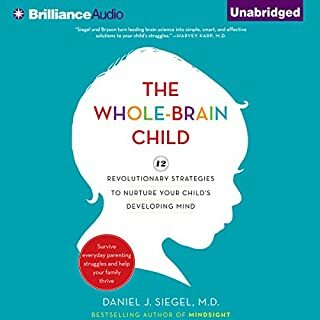 This book sounds good and indeed much in it is good for the "compliant child" which is why I am sure it does work good for some parents and their kids who are compliant. 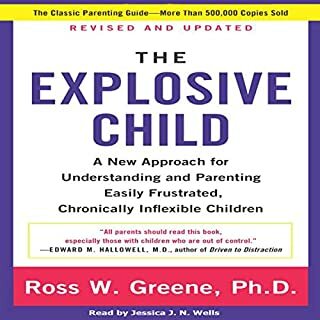 Furthermore, its intrinsically a very "passive parenting" approach that makes parents already doing this passive parenting feel good about what they are doing and indeed encourages them to double down on their current strategy, but does little to help them with more difficult, non compliant children. Although I really do use some of these strategies with my compliant children, it is a disaster for the others and I assure you they will walk all over you. 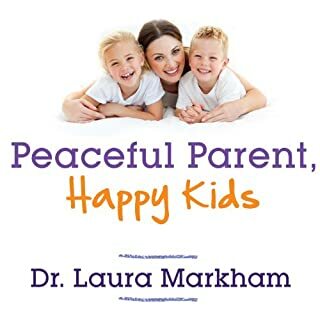 So if you want a 'feel good" book that basically says, your doing great, keep being passive and keep do what "feels" like the best parenting method with little guidance on more difficult children, go for it. However, for those of us looking for books to help with our more difficult children, I recommend Setting Limits with your Strong Willed Child by Robert MacKenzie. This book has changed my way of thinking and how I communicate! This is not just for parents, but teachers and pretty much anyone else who spends time talking with children. Love this book! Needs note to support the listening. 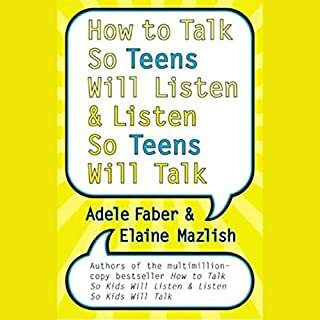 Where does How to Talk So Kids Will Listen & Listen So Kids Will Talk rank among all the audiobooks you’ve listened to so far? I could benefit from notes accompanying the book. I don't think I will purchase the book, but given a choice, I would go with the book so that I could refer to it easily. Talk of punishment, how it works and doesn't work. Using the skills described in this book has fundamentally improved my relationship with my tween-daughter. Instead of silence and talk-balk, I am getting voluntary disclosure and discussion. Learning and using these skills is an ongoing process and is a giant paradigm-shift in my communication-style with my daughter. It has been hard to steer away from punishment and actually work with my daughter to resolve the root-causes of non-compliance but in the end, she is willingly cooperating and contributing more than ever before. One of the key concepts seems to stem from treating a child as a person in the way Fred Rogers (of PBS-fame) acknowledged children and their feelings, a concept that rang true for me as a child who loved Mr. Rogers. Implementing the skills described in this book involves hard work and commitment but I have experienced only good results. The way this book is set up, one needs to pause to ponder and answer the questions and example-problems. That can be tricky if one is listening to the book while driving. The Audible iPhone app has a nice interface where one can easily pause and add bookmarks which I found helpful. Might seem too soft for some but the results are proven! I kept feeling conflicted by letting my 16 year old daughter get away with certain behaviors. Instead of fighting with her I acknowledge her feelings and she takes it from there. Very effective methods even if often they feel like you're letting your child get away with somethings you shouldn't. Intrinsic motivation is what's being encouraged. Wonderful book that has stood the test of 3 decades!